Tenerife is a remarkable island, dominated by Mount Teide, an active volcano higher than any mountain in mainland Spain. The island has extraordinary volcanic landscapes, and thousands of species of plants and animals that are found only there. The authors’ love of Tenerife stems from its enormous variety of habitats with their complex plant and animal communities. They have explored the island from the laurel forests of eastern Anaga to the cliffs of Los Gigantes in Teno, from the semi-deserts of the extreme south to the richly vegetated slopes along the north coast, and from remote black sand beaches to the lavas of Las Cañadas and the craters of Teide and Pico Viejo. Local Spanish experts have guided them to remote places and have contributed accounts of their own special interests. Introductory chapters discuss the extinct mammals, birds and reptiles, the island’s ecology and the impact of people. The five main types of landscape (ecosystems) are then considered; coastal and lowland shrubland; dry woodland remnants; laurel forest; pine forest and high mountain shrubland. Some special habitats are also described including the lava flows and volcanic caves, with their unique highly adapted invertebrate animals. Both vertebrates and invertebrates are treated systematically while photographs and brief descriptions of hundreds of endemic species of plants are included enabling easy identification. The island’s geology is also featured, in an account that covers both the oceanic context of the Canaries archipelago and the complex history of Tenerife itself, one of the most intriguing and most studied of all volcanoes. This comprehensive text provides a readily accessible and full account of an extraordinary island, referred to by Charles Darwin as ‘perhaps one of the most interesting places in the world’. As well as being of immense appeal to all naturalists, it will be a vital resource for residents, students and visitors interested in the natural history and geology of the island. 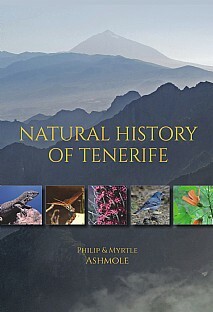 A wonderful overview of Tenerife for armchair travellers and anyone interested in natural history.